Choosing the correct shoes for infants and younger children can be a bit daunting, hopefully this guide will make you a little more confident when it comes to making your purchase. Babies which are not yet crawling or walking really do not need shoes, and it is advisable to let them keep their feet free so they can move and develop naturally. Wearing a pair of soft knitted of fleece material baby booties are a good idea to keep their feet warm when the temperature is cooler. If you would like your baby to wear shoes when you go out, opt for a very soft breathable material and make sure that the shoe is plenty big enough to allow for natural movement of the foot and toes. When your baby starts crawling, again they do not really need shoes but with all of the rubbing across the floor that the top of their foot will endure it is advisable to purchase a soft pair of shoes for some protection when the terrain is a bit rough. Although very delicate, babies feet are also very tough, and can naturally withstand the chaffing caused by crawling. Socks are adequate, but generally will end up trailing behind their feet most of the time! At home try to let your baby crawl around with bare feet or just socks, as the constant wearing of a shoe will inhibit their ability to develop the use of their feet. 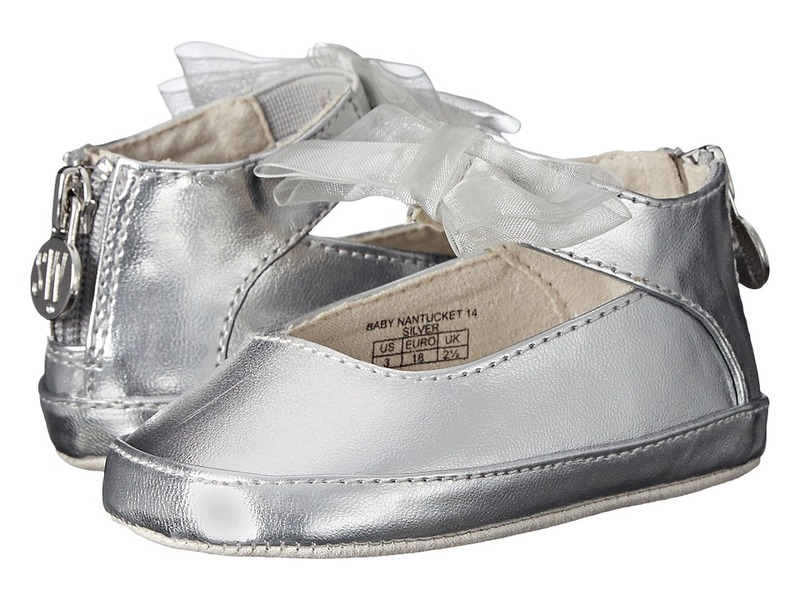 More for dress up time than for walking, these silver metallic girly, girl baby shoes are adorable. Once your baby has taken their first steps it is time to buy their first pair of walking shoes. Although bear in mind that the more time spent walking bare foot the better, as it helps your baby to figure out how their feet work and also helps the foot develop naturally. There are times when going bare foot is not practical or it is unsanitary so you need a good pair of shoes to protect their feet from harm. The shoes you select need to be soft and flexible and have a non slip sole. Ensure that the sole is not thick so that your baby can feel the floor beneath them. It is not necessary to buy high tops for ankle support, high tops could restrict the movement of the ankle which will hinder your babies walking progress. Make sure the material is soft and breathable to help keep their feet cool and comfortable. To check the fit of your baby's shoe, you should be able to fit your little finger between the heel of your baby's foot and the back of the shoe, also there should be a thumbs width gap between the big toe and the front of the shoe. 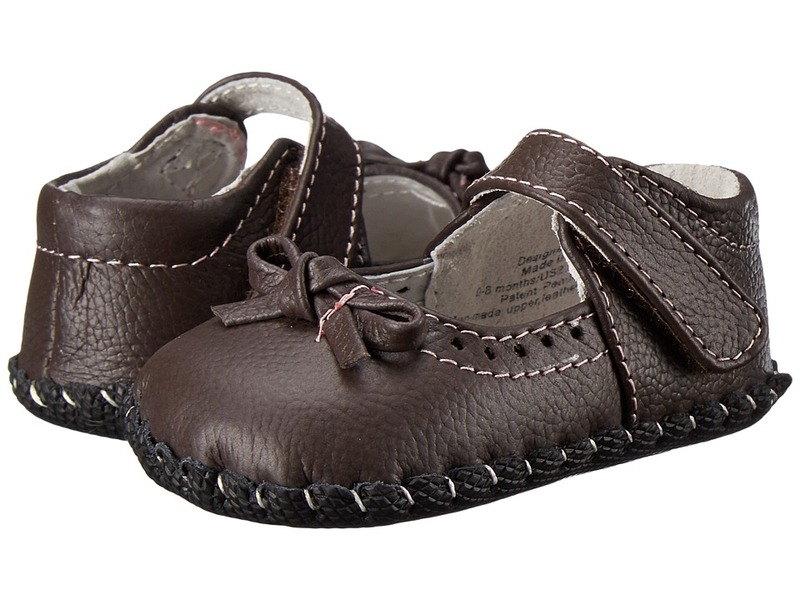 Classic Leather Baby Shoes have a small lace up and soft soles - perfect for the new walker. 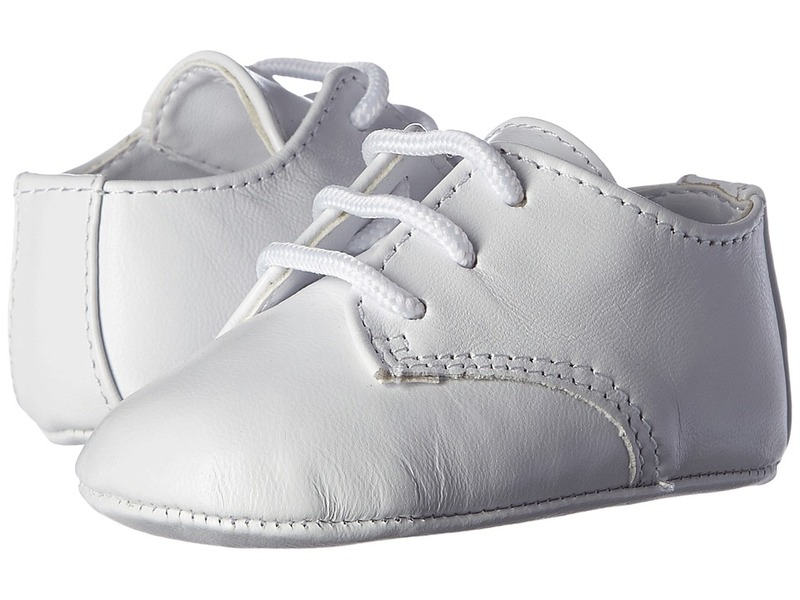 Baby shoes do not need to be "broken in" so get them to have a little walk around the shop with them on and watch to see if the shoes hinder their walking, then remove the shoes and check for any signs of pressure from the shoes on your babies' feet. Whether you choose Velcro or lace ups is a personal choice for you. Remember that the shoes will be taken on and off a lot, so many people opt for Velcro for convenience. If you select laced shoes, do not over tighten the laces or just as importantly do not tie them too loose. Velcro closures on baby shoes will be more forgiving when baby's feet swell. Something to remember is that when the weather is hot, and also towards the end of the day, children's feet swell just as adults do, so when shopping for shoes it might be an idea to go later in the day. Check the fit of your baby's shoes once a month, as children's feet grow at different rates there is no set period to purchase a new pair, but expect to buy a new pair every three to six months. Check the shoes often for signs of wear or damage, for example cracks on the bottom or holes or flapping parts on the top. Happy Baby Shoe Shopping - from one happy foot and shoe owner to another!